HD Files provides filing and office systems to businesses in Texas, Oklahoma, Kansas, Arkansas, Tennessee, and Mississippi. 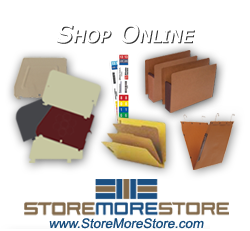 Our filing and office systems save more space than traditional filing cabinets. 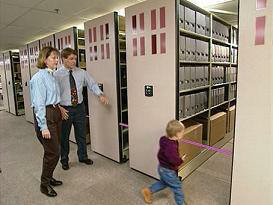 Basically, you can use less space while maintaining the same filing capacity in your office. In addition, you can lease or build less space. A recent client invested in 17 high density shelving systems for their filing areas, and showed a Return on Investment (ROI) in less than 16 months. High density shelving saves space, and with color-coded shelving solutions they can increase productivity over 35% in your centralized filing system. Once you see how a high density system like this can assist in a filing area, you will never go back to traditional filing cabinets. Did you know that the average filing cabinet costs more than high-density shelving, and uses a lot more floor space? Over 5,000 other companies in Texas, Oklahoma, Kansas, Arkansas, Tennessee, and Mississippi have high density shelving in their filing areas. 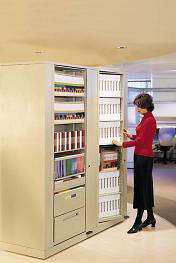 These shelving systems will provide a state-of-the-art filing solution for your office. Let our team perform a free analysis of your filing area to demonstrate how a high density shelving system will work for you. Systems like this are available on Texas State Contract (TXMAS) , U.S Communities Contract, GSA Contract , Healthcare Group Purchasing Contracts, Kansas StateContract, and many more.